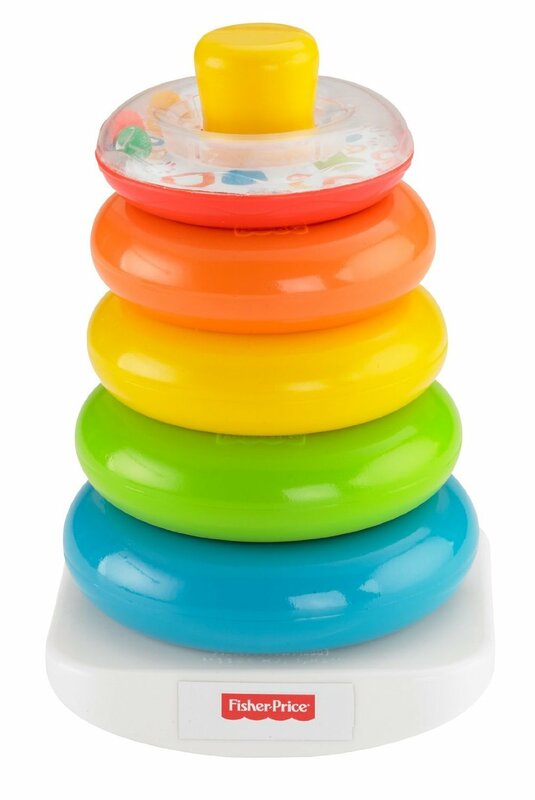 Five colored rings for babies and toddlers to grasp and stack. 5 rings in brilliant colors-blue, green, yellow, orange, and red for kids to play with and stack up. Made of durable plastic, they will last a long time and kids can use them in many ways, including chewing, grasping, and stacking. Five, vibrantly-colored rings to help babies and toddlers with their hand-eye coordination, basic motor skills, and colors. With the rings, children can take them off of the stand and play with them, rattle the top one that makes noise, and chew on them. Then, if they are at the age where they are able to, they can stack the rings back up on the stand. Children can also practice learning their colors, as the rings come in five different colors. 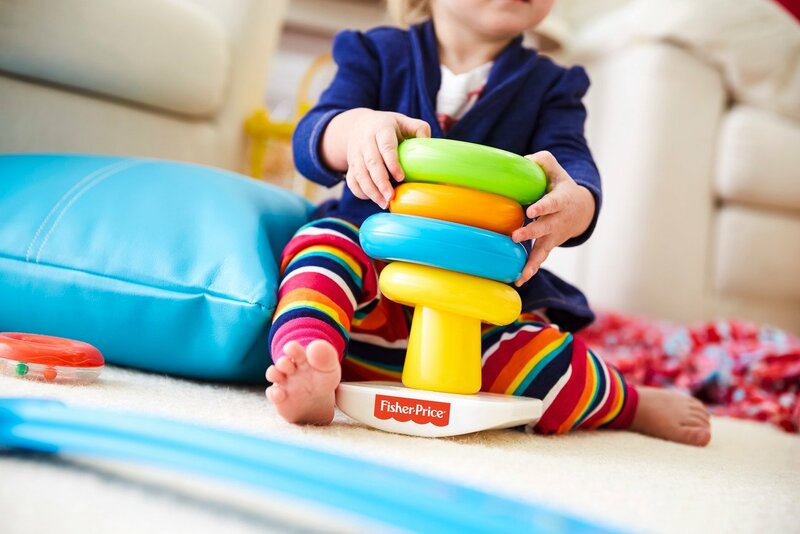 A great learning toy for kids, Fisher Price’s Brilliant Basics Rock-a-Stack has five brightly colored rings that all fit around a center holder that babies and toddlers can pick up, stack, and chew on. They are a nice, heavy duty plastic material, and are very easy to clean- just rinse and dry. Although they’re very durable, they are also very light, so kids ages six months and up can play with them. By stacking the rings, holding them, or playing with them in other ways help young babies and toddlers work on their motor skills. Especially for kids who are around the age of six months, they are learning to grasp things, so the rings provide an easy way to practice this skill. The red ring at the top rattles when it is moved or shaken, and reviewers have said that their babies love that it makes noise, and it is a nice touch. For older toddlers, the rings can be used to help them learn their colors. Also, users have said that their very young children haven’t actually stacked the rings, they just play with them and chew on them. An older toddler, however, may be able to stack the rings and put them in order. For all ages that use this toy, it helps with hand-eye coordination by having to take the rings off the holder, grab them, and stack them back up. Several users have complained that when they got their set of rings, the dye was coming off of the rings, specifically the blue one. It was staining other household materials and the paint just kept coming off. However, users who have bought the toy since then have reported no complaints of blue dye and paint, so the issue has been resolved. In each ring, there are small air holes, and so for washing, cover the small hole to avoid getting water inside, because it has been said that it is really hard to get out. The main concern users had with this toy was that blue dye was getting all over when the opened the package. A few people have reported this problem, but since then, it seems like this blue dye and paint is no longer an issue. Just to be safe, you can wash the rings off either in the sink or with a damp cloth before giving them to a child.